The fourth and final day of the inaugural Menorca Maxi saw the nine Wallys and three Js race under tough and tricky conditions. The early morning rain failed to dampen the spirits of organisers, who were eager to close a spectacular week of racing on a high note. The shifty winds and passing rain clouds caused a one-hour postponement but the race committee was finally able to hold two close races for the Wally Class and one for the Js. While the top of the leaderboard was almost decided heading into the final day, the Wally class saw a match race take place in the second race, between the equally-matched Sensei and Galma. Alberto Palatchi's Galma prevailed and closed the podium places, just one point ahead of Sensei. Antonio Cacace's Magic Blue was the clear favorite heading into Sunday, but the rest of the podium places were still up for grabs with three boats, Magic Carpet3, Sensei and Galma having a shot at second and third place. The first race was easily won by Magic Blue. Wally founder and CEO, Luca Bassani, called for the favoured right-hand side of the course and the Italian boat led from start to finish on corrected time. The former Magic Carpet2 proved again to be the most competitive boat of the fleet and until Magic Carpet3 is fully optimised, Antonio Cacace is steering one of the fleet's top performers. The brisk breeze that reached 20 knots in the first beat brought the best out of her. With the top two spots of the overall leaderboard decided, the real battle was between Sensei and Galma, tied on 15 points in third. Having the exact same rating, the two boats held a true match race that saw Sensei take the early lead, rounding the first weather mark ahead of their opponents. Galma showed better speed downwind and was able, half-way through the first run, to gybe in front of Sensei and overtake her. Having taken the lead, Alberto Palatchi's boat closely covered her opponent and was able to fend off their attacks, taking a third and clinching the overall third place, just one point ahead of Sensei. Antonio Cacace, Magic Blue owner, commented on the team's success: "The key to this victory is to have an excellent crew, a fantastic tactician such as Luca Bassani, to put a lot of effort and keep focused. “We started racing last September, so this is our first true season in the Wally Class. First of all, part of the merit goes to Sir Lindsay Owen-Jones that created a boat which won the world championship three times. He kept fine tuning it every year and in fact, when I bought it he told me that I would probably be the strongest in the fleet because he would need some more time to reach the optimum setup. “What I appreciate in the Wally class is the high-level competition. All owners and crews are of a high calibre and the winner is the one that makes the least amount of mistakes. I'm lucky to be surrounded by very good teachers and I try to learn as fast as possible and reward a crew that has raced in so many America's Cups that merit my full effort. “We had an extraordinary welcoming here in Menorca, thanks to Alberto Palatchi whose idea this event was. I was really surprised by the involvement of the local authorities. They realised the importance of this event to them and helped organize such a great regatta." 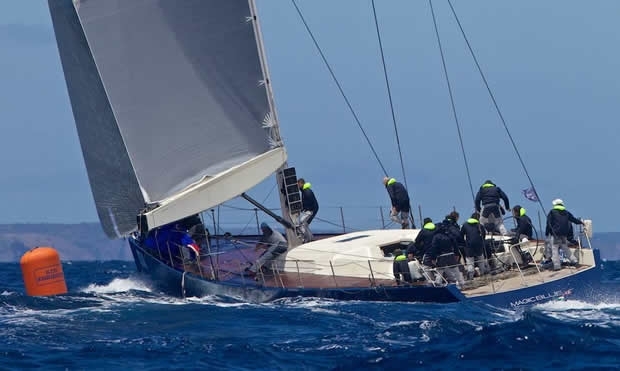 Lionheart continued her dominant form in the final race for the three J Class yachts competing at the Menorca Maxi, taking her fifth straight win to secure the regatta victory. Despite Lionheart’s unbeatable scoresheet, there was yet more close racing for the Js on the final day in Mahon. The fleet arrived at the starting area in heavy showers and a large swell, however conditions moderated for today’s single windward-leeward race to 13-18 knots of northeasterly breeze, with the sunshine making a welcome return throughout the afternoon. On the first beat Ranger tacked off left while Hanuman took the right-hand side, and when the three boats converged at the top mark there was little to split them. As the three J Class hit the starboard layline, Ranger slipped in between Lionheart, which rounded in first place, and Hanuman in third. The fleet rounded the windward mark with just two boat lengths separating each place, and hoisted in near-unison. Downwind they continued to be closely matched, with all three Js gybing in perfect synchronisation for the leeward mark. Lionheart rounded first, ahead of Ranger and Hanuman. The second beat saw some of the closest upwind racing of the week, with Ranger working hard to protect the right, forcing Hanuman to repeatedly tack off. Lionheart slightly extended their lead on this second windward leg and again was first around the top mark, while Hanuman continued to hunt Ranger closely. On the final downwind leg, Hanuman gybed off first with Ranger following to cover shortly after. Confident of their advantage, Lionheart continued straight to the finish, and crossed the line to take their fifth successive bullet of the series and secure the event win with a perfect scoreline. Winning skipper Bouwe Bekking said after racing: “You don’t have regattas like this very often. If you’re in the flow then everything just goes really nicely, and everything was good – the starts, the crew work was good, we were going in the right direction, we have a great owner-driver, so it was all coming together this week. “It’s basically the same team as last year. We made a couple of changes, as you normally do when it’s such a big crew, but we have quite an intensive training exercise when we’re out, we really do a lot of practice and then every day we do big debriefs as well with video, and I think it just makes us better. It’s great teamwork that we’ve been getting together. “The boats are so close with each other and I think the guys who are ahead very often can just stretch a little bit. We’ve been lucky that for much of the races we’ve been first at the top mark, so that’s always a good feeling. “The venue is just magnificent – I’ve been racing here before but I’m always amazed that there’s not more regattas over here, because you’re right down town, it’s always really nice to sail out of the harbour, and this week the breeze has been fantastic as well. Ranger, skippered by Erle Williams, took second in today’s race and second overall, with a two-point advantage over Hanuman, who finished in third place overall. Ken Read, skipper of Hanuman, commented on the regatta: “It’s certainly a little disappointing results-wise. It was a little over a year ago we stepped up the programme pretty big-time, and we’ve – as it appeared – been a little complacent since, and everybody else has caught up. Especially Lionheart, who have been going fantastically, and so have had a really good event. “So this is a nice wake-up call for us, prior to the big event in Palma with all five Js back on the line, and I think we’ve got to get our act together here, it’s plain and simple. “You look at the calibre of sailors in this class and the commitment of the ownership of each of these boats and it really doesn’t get much better than this in competitive sailing. The fact that we’re sailing around museum pieces at the same time, and the racing is really something else!